Have you lost interest yet? We hear that expression all the time! And more importantly, how can you actually use social media to grow your business? We hear all these buzz words and expressions about social media’s “tremendous” power (by the way, its power is tremendous), but what’s more interesting is how you can extract that awesomeness into your very own marketing strategy, and achieve the results everyone seems to be getting. In this article, I’m listing 8 Tips to Grow Your Business Using Social Media, so you can achieve the great results everybody seems to be talking about. To succeed on social media, you need to put out great content. Social media is driven around content, and the only way to succeed is to create and share content. In fact, A study by Nielsen in 2011 showed that 27 million pieces of content were shared every day. Today, 3.2 billion images are shared each day! That’s an insane amount of content completely blowing up the internet, so what does this mean for you? Average won’t just cut it. 3.2 bilion images are shared every day. If you want to have any chance in reaching success on social media, you need to create attention-grabbing content that stands out in the extremely competitive landscape of social media. Why exactly should you create content? We’ll partly, it speaks for itself. But partly, there’s benefits of creating amazing content that stretches further than simply getting discovered by people on social media. Create amazing content that provide value. 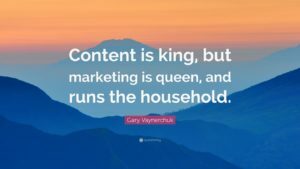 This phenomenon is described in Gary’s book Jab, Jab, Jab, right hook, but let’s go more into detail, because this is so important when it comes to creating content. It shouldn’t just be beautiful to look at. As a brand, you cannot ask for a customer for a sale right on the spot, on the first encountering. First, you need to provide value time and time over, and then ask for the sale. With content, you can do just that. “Concistency is key” is something we hear all the time. When we talk about consistency, the comprehensive reason is your brand message. When I say Coca-Cola, what do you think of? Maybe you think about happiness, smiles, the colour red, or maybe something completely different? 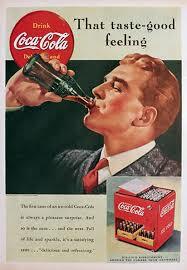 The point is that all of the things mentioned is what Coca-Cola is actively working to make you associate them with. They want people to see them as a positive and happy brand that is a bit modern, but still stays true to its roots. 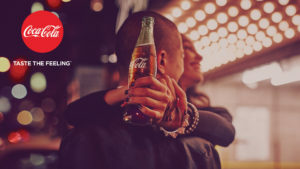 That’s the brand message Coca-Cola wants to convey to its customers. And that’s also the message and impression they’ve been able to give to million of customers. The thing is that a brand message and a brand personality isn’t going to be born over a week or even a month. To create a personality for your brand that people will associate you for, you need to consistently market and follow it. When you time and time over show that you are the same personality year after year, that will also be what people remember you as. Now, compare that to an ad from 2017. 77 years between them and not much has changed! The punchline is that if Coca-Cola wouldn’t have been as clever in their consistent marketing, they wouldn’t be as large as they are today. It’s self-explanatory but you can’t crate a consistent brand message if you aren’t aware of your brand message yourself. Do you want to be seen as a controversial, humoristic, fun, exciting, grumpy, conservative? According to me, this is the most important part. You obviously want to mediate a brand message that resonates with the people you are trying to target and reach. If your target audience is teens, then obviously you won’t see very much success if you present your brand with a personality that is old, boring and conservative. When talking about a consistent message on social media, we’re usually talking about a consistent visual message (creating one successfully is an art that needs to be mastered) and a text-based message. When posting visuals on social media, they need to be of a certain style that reflects your brand, and they need to be of a consistent style. 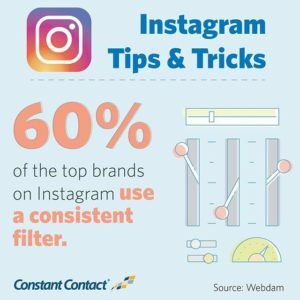 Did you know that 60% of top brands on Instagram uses a consistent filter? And that’s just one way to make your visuals easily distinguishable. You should also think about the language in which you write in. No, I am not talking about the language as in Spanish or Asian, but more the style you are writing in. Are you going to use slang or jargon? How you write should be reflected in the language your target audience is using. Succeed to use the same language as them, and you’ll have an easier time engaging and interacting with them. Plus, they’ll resonate better with your brand. Last but not least, the posting schedule is also something worth mentioning when talking about consistency on social media. Whether you plan on posting once, twice, or even every day a week, make sure you do it consistently. If you hop from posting once a week to once a month, and then to 20 times a week, you’ll confuse your audience, and they’ll leave you. Bottom line: decide on a posting schedule and stick to it. No matter where I go, people are talking about the importance of content. And yes, content is extremely important on social media. There’s no going around that. But what about the context of the content you put out on social media? Whenever you speak about content, you need to think about context as well. Because context is vital for the success of your content. But what does context mean, more specifically? Gary Vaynerchuk elaborates: “The talent to put out the content is only one piece of the equation”. To create context, you first need to respect your target audience and the reason why your audience is on the platform where you’re trying to reach them. People have different agendas and mindsets when they’re on different platforms (more on that later) and that’s what you need to be aware of. Not all social platforms are the same. Know your audience’s intent with social and you’ll be able to reach your audience’s needs with your content better. You also need to respect your audience when creating content for social. This goes hand in hand with respecting the platform, but what it essentially means is that you need to be putting out content that your audience likes, rather than content that you like. Try to find pain points and interest points that your audience have, and speak to them through content that is put in context for them. The result will be amazing content that they resonate better with. Sounds like a fair trade? When it comes to context, the user experience is another aspect that is vital if you want your content to succeed. This means that with the content you present, it should be what you see is what you get. Don’t annoy your audience with an ad before the video starts, or forcing your social followers to sign up to your newsletter before they can see a post from you. If they find value with the content you provide, the other part will come naturally. And in a way that is far more valuable than forcing. We often hear that we should throw ourselves into every social media platform there is. But is that really the way to go? The boring truth is that it depends. Gosh, don’t we hate that expression? Luckily, I won’t leave you hanging. Let me elaborate on what it depends on. First off, it depends on time and resources. When looking to start working with social media, you should have a clear strategy on how much time you’re going to spend on social, and what resources you need to successfully implement it into your marketing strategy. If you start a social media account with the belief that you may have time to manage it, don’t bother. If it’s something that business owners who have implemented social media can agree on, it is that it demands more time than they first thoughts. If you start social media accounts, share a few pictures, then realize that it’s way too time-consuming, and abandon it, it will do more harm than good. Most brands have the time and resources to manage one or two platforms, but when it comes to using more than that, things can get a little tricky on the time end. Therefore, it is important that you are aware of the fact that social media is time-consuming. And if you don’t have the resources to manage several social media accounts, you’ll be far better of putting all our efforts on one or two rather than spreading them across several. Bottom line: don’t bit off more than you can chew. Whether you should use “all” social media platforms or just a few, depends on one more cornerstone factor. As I mentioned not all social media platforms are equal, and nor are their user demographics. When deciding on what platforms to use, looking at the user demographics of the various platforms is essential. Because all demographics look differently, and if you would choose a platform that you might believe is suitable for you, just to realize that its user demographics is completely different from what your target audience is; then you’re wasting your efforts. Pinterest, for example, is known to attract a female audience. 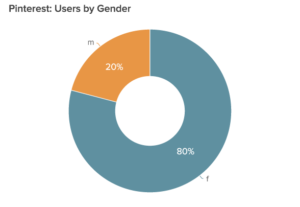 In fact, about 80% of its user base consists of women. If you’re a brand selling men’s underwear, chances are you’ll get far better results from your efforts on a platform that is more oriented towards male users. Chances are that you’re active on more than one social media platform. For most of you, sharing content across platforms means one thing. Creating a post on one social media platform, then clicking in the platforms you want it to be posted on. The only problem is that it’s a bad idea. Chances are also that many of your followers are following you on several platforms. Especially if you have cross-rooted your presence on your other social platforms. But if you’re sharing the exact same content on all your social platforms, what is the point of following you on more than one? Having a successful social media presence isn’t about sharing the same posts across your accounts. It’s about formatting those posts to fit each one individually. 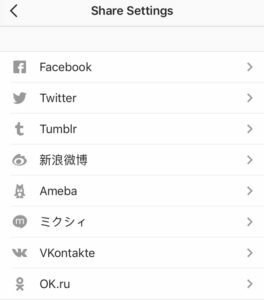 All social platforms are different and should be treated that way. For Twitter, it’s about delivering short and snappy messages, for LinkedIn long posts, and for YouTube videos. The bottom line is that all of your posts should be different, even if they are delivering the same message. Social media is a great tool for marketing, but in order to achieve results worthwhile, there are things you need to do and follow. 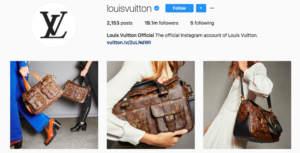 No matter what brand you are, and what goals you have, these 5 tips are relevant to everyone looking to reach success on social media.